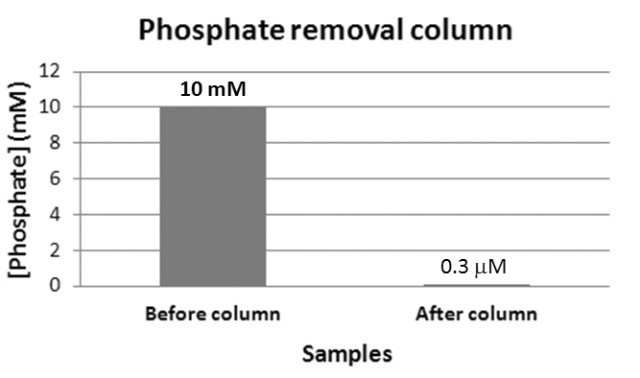 ProFoldin phosphate removal columns are designed to remove phosphate from a buffer solution. For example, the phosphate concentration can be reduced from 10 mM to lower than 0.001 mM. The principle of phosphate removal is based on interactions between phosphate and the column resin. The phosphate stays on the column. The phosphate binding capacity of the resin is 0.20 mmole per milliliter of the bed volume. Other buffer components including regular buffer salts and non-charged molecules such as sugar and glycerol do not bind to the resin and therefore stay in the sample solution. Some organic phosphates such as ATP also bind to the resin but not as strongly as inorganic phosphate. Metal chelators such as EDTA interfere the phosphate-resin binding. The Micro Phosphate Removal Column Set (Catalog number: MPR020) contains 20 pre-packed spin-columns. Each spin column removes phosphate from 500 mM down to 3 mM; It removes phosphate from 350 mM down to 0.5 mM; It removes phosphate from 175 mM down to 0.2 mM; It removes phosphate from 87.5 mM down to less than 0.001 mM. Lee JA et al, Patient derived mutation W257G of PPP2R1A enhances cancer cell migration through SRC-JNK-c-Jun pathway. Scientific Reports, Vol.6, Article number: 27391 (2016).